White View Lodge in Crook, near Bishop Auckland, County Durham sleeps 10 people. White View Lodge near Bishop is perched on a hill and overlooks the fabulous countryside of County Durham; White View Lodge really does live up to its name. Only a short walk from the centre of Crook, guests will find themselves in the perfect location for exploring the local area. Often regarded as The Gateway to Weardale, the popular market town of Crook features a thriving town centre with a variety of shops, cafés, restaurants and a market that is held on Tuesdays and Saturdays. There are two prominent churches, the centrally located St Catherine’s CE, and Our Lady Immaculate and St Cuthbert’s RC on Church Hill. On top of the hills to the east sits Crook Golf Club, its challenging 18-hole course offering spectacular views of the local countryside. Perfect for walkers and cyclists, the River Wear runs just 2 miles away and there are many riverside walks and cycle paths to explore and enjoy. Only a short distance from popular villages and towns including Wolsingham, Frosterley and Stanhope guests will be able to enjoy taking popular walks right through to the upper reaches of Weardale, which is rightly designated as an Area of Outstanding Natural Beauty. Perfect for active families and guests of all ages, Hamsterley Forest is only 6 miles away and is a delightful 2,000-hectare site of popular walking trails including the Gruffalo Trail, cycle trails and orienteering, as well as plenty of spots for the perfect picnic. Only 4 miles away guests will find Witton Castle in Witton-le-Wear, which offers fly fishing, a bird sanctuary, historic castle and beautiful grounds. This detached property is located just over 5 miles away from Bishop Auckland, which is home to the Kynren Eleven Arches Spectacular from July-September 2017 and really must be visited. This epic tale of England is set to be a historical extravaganza with a cast of over 1,000 people and set over 7½ acres of County Durham, and promises 14 action packed and movie-like performances of colossal and dazzling proportions. The show will incorporate a full size lake with pyrotechnics, stunning lighting and water effects. Also ideal for guests wanting to visit the cathedral city of Durham, White View Lodge is just under a 20-minute drive away. Perfect as a holiday home for guests with friends and family based at Durham University, all of the main campuses can be reached within a 20-minute drive making White View Lodge a super property to book for guests wanting to enjoy a graduation ceremony, attend taster weeks and explore the campuses before the start of the university year, and a great location for celebrating a university reunion with friends old and new. A current World Heritage Site, Durham is home to many popular tourist attractions, which include the Lumiere Festival, jazz festival, book week, arts week, the theatre, castle and cathedral, as well as many designer boutiques and shops. 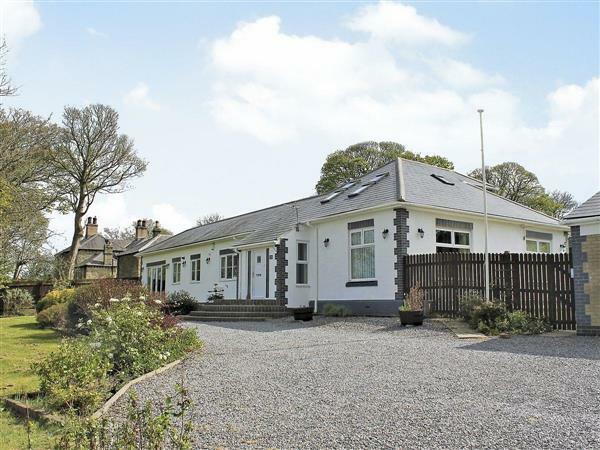 White View Lodge occupies a generous corner plot on the outer edge of Crook with larger than average landscaped front garden set back from the road, and with parking for four cars. To the rear of the property sits a beautiful paved and gravelled patio, providing a superb private outside space for relaxing in the hot tub and enjoying a barbecue. There is also an enclosed lawned garden with greenhouse and ample lawns at the front of the property for families to enjoy a spot of badminton or a ball game. The outside dining area is covered by a gazebo which can be used in all weather. Warm, welcoming, spacious and light, White View Lodge is a real gem of a property that can be enjoyed for family get-togethers, celebrations and reunions at any time of year and whatever the weather. The shop, pub and restaurant are 1 mile from White View Lodge near Bishop. Living room: With wood burner, 50 Sky TV, DVD player and French doors leading to garden. Games room: With pool/snooker table, Freeview TV, DVD player, Playstation, darts board, piano, karoake machine and selection of board games. Bedroom 4: With 3 single beds and Freeview TV. Gas central heating, electricity, bed linen, towels and Wi-Fi included. Initial logs for wood burner included. Travel cot, highchair and stairgate. Welcome pack. Large enclosed lawned garden with terrace, patio, garden furniture, barbecue and chiminea. Hot tub for 8 (private). Private parking for 4 cars. No smoking. Holidays at White View Lodge run from Friday to Friday. Pets allowed at White View Lodge. For a better idea of where White View Lodge is, you can see White View Lodge on the map below. White View Lodge is in Durham; should you be on the lookout for a special offer, you can find all the special offers in Durham. It's always worth checking to see what is on offer at the moment. Do you want to holiday near White View Lodge (UKC1754), you can see other cottages within 25 miles of White View Lodge; have a look to find your perfect holiday location.